Master STAGES™ Skramex™ is a super concentrated, high-powered cleaner designed for factory floor cleaning and heavy maintenance cleaning, particularly in metalworking or rebuild shops and mills. This product is highly caustic and capable of emulsifying even the most difficult floor soils such as those used in machining, drawing, stamping, foundries, and mills. 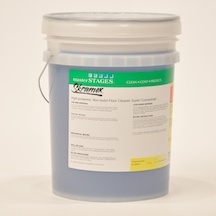 Skramex is specially formulated without 2-butoxyethanol (Butyl) to eliminate government reporting requirements.